After enduring the driest four-year period ever recorded, California's drought emergency has come to an end. But things may never be the same in the Golden State. A super bloom of flowers prompted by heavy rains near Taft, California, is seen on April 6. Five years of extreme drought laid waste to California's endless lawns. It withered forests and choked farms. The earth sank into itself, as if hell were about to open up. On Friday, California Gov. Jerry Brown lifted a series of emergency orders he put in place in 2014 and 2015 as part of a desperate attempt to save California's dwindling water supply. In a statement, Brown declared Friday that "this drought emergency is over." The end of the water restrictions (they remain in place for a few rural counties) marks a stunning turn of events that was all but inconceivable just a year ago. At the time, California was suffering through the worst drought period ever recorded. Less than 4% of the state was free of abnormal dryness and nearly a third was suffering through the most extreme level of drought. 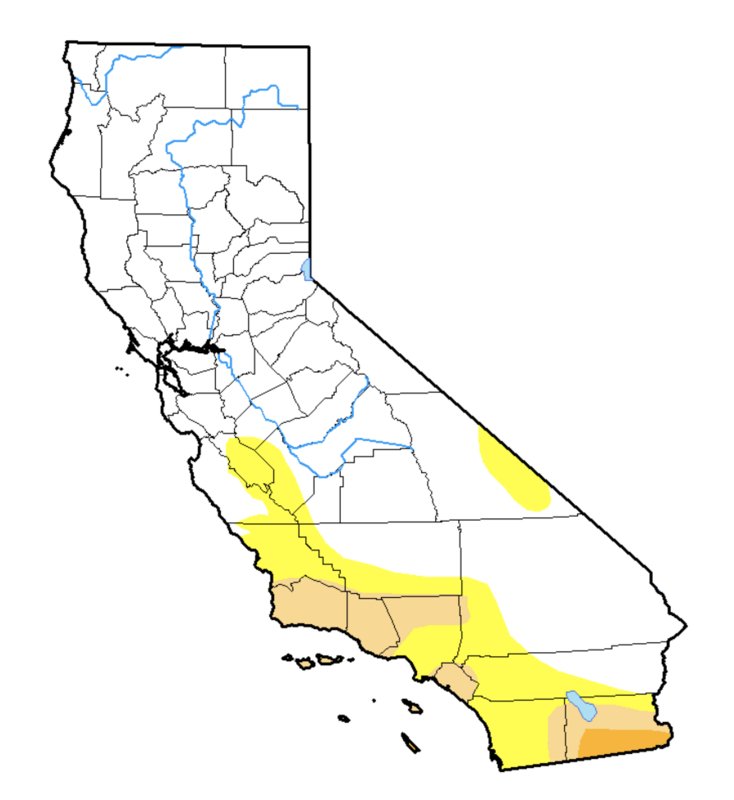 Today, at the end of an extraordinarily wet winter, only about 8% of California is experiencing drought. And it's a mild one at that. US Drought Monitor maps show the severity of the drought in April 2016 and April 2017. The drought began in 2011, and during each subsequent rainy season, spanning from October to April, hopes of a recovery were dashed. By 2014, California's snowpack, which supplies much of the state with water, was almost gone and Brown officially declared the drought an emergency that came with a series of restrictions and regulations. By April 2015, snowpack was just 5% of normal. Reservoirs didn't fair much better;, all of California's largest water storage facilities were well below their average levels. The two largest reservoirs in the state, Lake Shasta and Lake Oroville, were at only half capacity. The result was crushing water conditions across much of the state. In rural areas, the lack of water forced farmers in the Central Valley to make cuts and dig deeper wells, which in turn lead to "subsidence," or the ground sinking. A buckle in the lining of the Delta Mendota Canal caused by sinking land near Dos Palos, California, as seen on Dec. 22, 2015. In rural communities, thousands of people literally had no tap water. In the state's forests, millions of trees — weakened by thirst and susceptible to bark beetles — died off, becoming vast tinder boxes that significantly exacerbated wildfire seasons. Jay Lund, director of the University of California, Davis' Center for Watershed Sciences, said that those trees may not be coming back. "That might actually been seen as the biggest impact of the drought," Lund told BuzzFeed News. "We might be seeing a permanent change in the ecosystems at higher elevations." Dead trees in the Sierra National Forest. The drought also had a profound effect on California's urban areas, which were required to cut water usage by 25%. Officials specifically targeted what they deemed unnecessary uses of water, such as irrigating lawns and car washing. Thousands of people were fined, and Southern California media outlets launched a search for an especially egregious water waster dubbed the "wet prince of Bel-Air." By mid-2015 the efforts had worked; California cities dramatically reduced how much water they used, prompted by various fines and outreach campaigns. Urban areas became landscapes of drought symbolism: lawns died, or were replaced with artificial turf; restaurants stopped volunteering tap water and put out signs about the shortage; "drought shaming," or calling out neighbors for apparent waste, became an actual thing. A buoy sits on the dry, cracked bed of Lake Mendocino near Ukiah, Calif., in Feb. 2014. 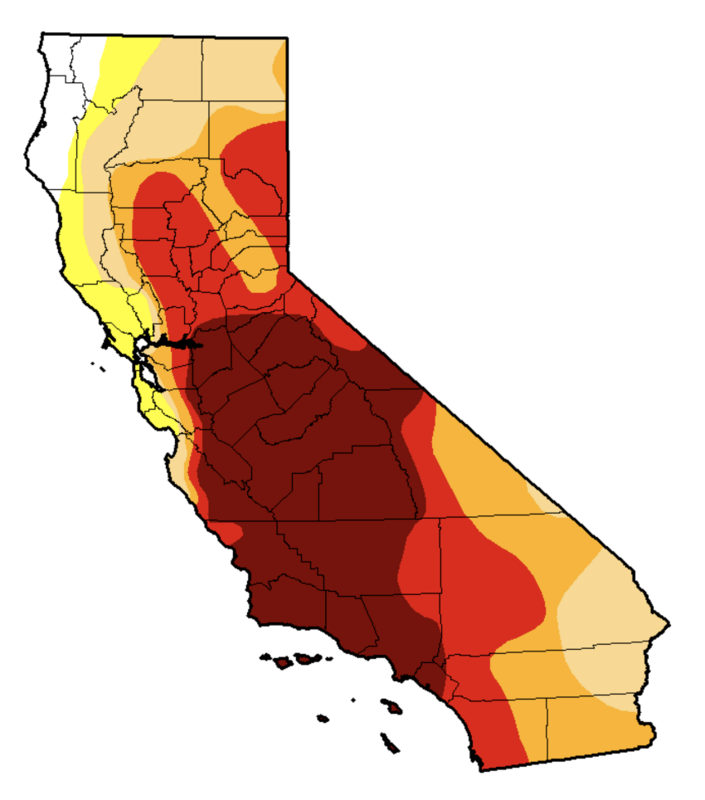 The turn around in California's drought this year has been equally dramatic. The 2016-2017 season is currently the second wettest on record in California. "Everybody can see that we had a spectacular winter in terms of rainfall and snowpack," Bill Patzert, a NASA climatologist, told BuzzFeed News. As of Friday, most of the state's major reservoirs were at or above their historical averages. Several were near capacity, and there was so much water that the Oroville dam — the tallest in the US — was overwhelmed in February thanks to an eroded spillway. In the Sierra Nevada mountains, snowpack currently sits at 161% of normal and NASA satellite imagery shows a stark contrast to 2014, when the emergency was declared. Satellite images show California in January 2014, left, and February 2017. Though the emergency may have ended, the legacy of the drought will live on. In his proclamation Friday, Brown warned that "the next drought could be around the corner." "Conservation must remain a way of life," he added. To that end, Brown left in place requirements for communities to report their water usage, as well as restrictions on watering lawns and spraying off sidewalks. He also announced a plan to "establish long-term water conservation measures and improved planning for more frequent and severe droughts." Experts who spoke with BuzzFeed News said an array of drought-inspired regulations will continue to moderate Californians' water use, even as the worst of the water shortage itself fades into history. There are new efficiency standards for things like shower heads, for example, and Brown has signed unprecedented new laws governing groundwater, which had previously gone unregulated and may not recover any time soon. "The drought was so punishing that we really over drafted" aquifers in the Central Valley, Patzert said. "They have not recovered, especially in Southern California." Lawns, long a symbol of California living, may never return to some neighborhoods. "I think the big shift we’ll see is again the war on lawns, trying to suppress urban water use," Lund said. "There will be considerable residual pressure." The drought lifestyle in some form, will continue. Californians walk their dogs beside real grass, left, and artificial turf, right, in Garden Grove on May 6, 2015. But while California is off the hook for now, another water shortage may not be that far away. Lake Mead in Nevada, which helps supply large amounts of water to the thirsty cities of Southern California, has not made a significant recovery this year. The Golden State also has a long history with major droughts which, combined with an an ever-increasing population, could mean plenty of dry times in the future. "In California, there’s never an end to the drought," Patzert said. "It’s always lurking. Continued population growth will always impose unquenchable demands on the water supply."